The number of store closures on Scotland's high streets has fallen to its lowest level in the last six years, according to new analysis. There were 265 closures in eight Scottish cities and towns in 2018 - offset by 146 new store openings. That means a net loss of 119 compared to the record figure of 148 in 2017. But auditors PwC said the figures showed high streets were still being "blighted by closures as the retail landscape faces a new future". The number of shop closures outnumbered openings in all eight areas included in the research by the Local Data Company for PwC. In Aberdeen, 15 new shops opened but 42 closed. Paisley suffered the greatest impact as a proportion of its total shop numbers, down nine to 114. Perth had the fewest closures with seven, although just four new stores opened up. Ayr and Dundee each had a net loss of five stores. The number of shops in Falkirk dropped from 130 to 124. 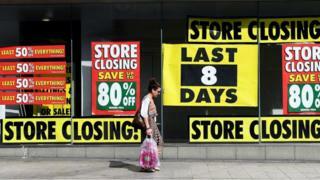 Across the UK, there was a record net loss of 2,481 stores from the biggest 500 high streets last year. That was 709 net closures higher than in 2017, with 3,372 shops opening and 5,853 shutting. Mark Addley, of PwC in Scotland, said the drop in the number of store closures had to be weighed against openings at almost half the total of five years ago. He said: "There remain enormous challenges across our high streets." Mr Addley added: "We have already seen casualties in 2019 and we fully expect to see more, with retail companies facing an uphill battle to survive, never mind thrive. "To be in the best possible shape to get through this, retailers must focus on ensuring they have the right proposition, and the investment required to deliver it." In 2017, the number of closures dropped to 290, but a big reduction in new openings led to the record net loss of 148 shops.